← First Fruits: Supporting the Hudson Valley Regional Food Bank in 2018. 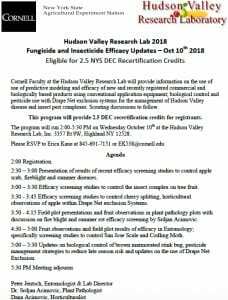 A workshop titled “2018 Fungicide & Insecticide Efficacy and Horticultural Studies Updates” will be presented on Wednesday October 10th, 2018 at the Hudson Valley Research Laboratory Inc. on 3357 Rt 9W, Highland NY 12528. Cornell Faculty at the Hudson Valley Research Lab will provide information on the use of use of predictive modeling and efficacy of new and recently registered commercial and biologically based products using conventional application equipment; biological control and pesticide use with Drape Net exclusion systems for the management of Hudson Valley disease and insect pest complexes. Scouting discussions to follow. This program will provide 2.5 DEC recertification credits for registrants. The program will run 2:00-5:30 PM on Wednesday October 10th at the Hudson Valley Research Lab, Inc. 3357 Rt 9W, Highland NY 12528. Please RSVP to Erica Kane at 845-691-7151 or EK538@cornell.edu. 2:30 – 3:00 Presentation of results of recent efficacy screening studies to control apple scab, fireblight and summer diseases. 3:00 – 3:30 Efficacy screening studies to control the insect complex on tree fruit. 3:30 – 3:45 Efficacy screening studies to control cherry splitting, horticultural observations of apple within Drape Net exclusion Systems. 3:50 – 4:15 Field plot presentations and fruit observations in plant pathology plots with discussion on fire blight and summer rot efficacy screening by Srdjan Acimovic. 4:30 – 5:00 Fruit observations and field plot results of efficacy in Entomology; specifically screening studies to control San Jose Scale and Codling Moth. 5:00 – 5:30 Updates on biological control of brown marmorated stink bug, pesticide management strategies to reduce late season risk and updates on the use of Drape Net Exclusion.